When we picture our lives spent with a dog, pleasant images of taking them walks with our families on beautiful sunny days spring to mind. What we don’t picture however is the torrential rain, the stormy nights, or the long desert days when we’ve just arrived home from work after the worst day and your dog needs a walk. Depriving our pooches of their basic exercise needs is unforgivable – after all, it’s not their fault that time just seems to slip away. Thankfully, there exists a trustworthy alternative out there – dog treadmills. Although they cannot and should not substitute for your dog’s daily walk outdoors, dog treadmills are a reliable backup for when it’s impossible to go outside. To help you along the way, we’ve selected the top five treadmills for your dog out there to maximize their health and happiness. Imagine the perfect dog treadmill. Then take one look at dogPACER’s Treadmill and be amazed by the similarities between this model and the model in your head. Design-wise, this functional product is at the top of its game due to its side bars and patented folding technology. dogPACER understand that using a treadmill isn’t as visually exciting as going out for a run with your dog; which is why they’ve customized pre-set exercise programs to meet their fitness goals and boost their confidence. For dogs that get spooked easily, this treadmill is designed to alleviate this stress by operating with minimal noise. Ideal for accommodating larger dogs up to 180 pounds, dogPACER’s product is ideal for improving their overall fitness form thanks to the large running area on offer. Go Pet’s Dog Treadmill is designed to meet every small canines’ fitness needs. With all the incredible features on offer including a stop button and speed features, your furry friend won’t ever want to get off their new treadmill. 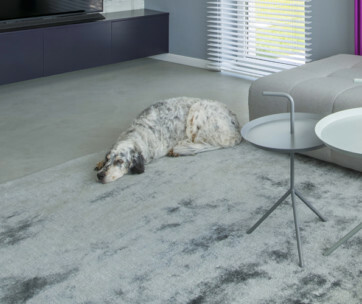 For the price, you’ll receive top-of-the-range features designed to make your dog comfortable, including a silent driving system for jumpier dogs. Suitable for use for dogs under 44 pounds, the lowest speed of one mile an hour encourages dogs to get fit quick whilst having a comfortable base to fall back on. As an absolute must for those who hate the bad weather, we recommend buying this treadmill today. This product isn’t only a treadmill for dogs… it’s a treadwheel! And we can safely say that it lives up to all our expectations. Don’t let the price dissuade you; this treadwheel is an excellent example of how we are adapting our family fitness needs along with society’s increasing working hours. When you are home, placing the treadwheel outdoors is even possible thanks to the products’ UV resistance. 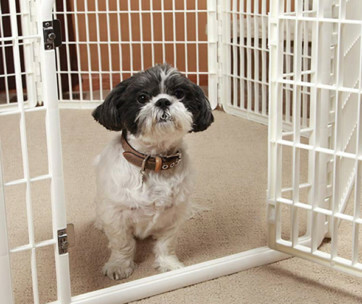 With the inclusion of a training door and a durable matted surface, this treadwheel ­– although it may seem a little precarious – is designed to keep your dog out of harm’s way. If they are always filled with energy, the resistance adjustment will eventually tire them out. A commendable product designed to keep your dog happy and healthy even when time is of the essence. GoPet’s Treadmill for small to medium dogs is a product which entirely disproves the statement that ‘dog and human treadmills are the same’. 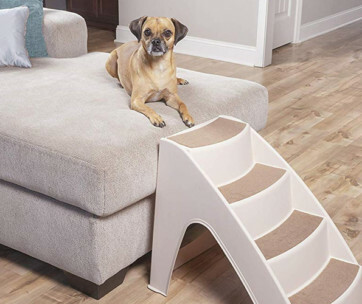 With its quiet running noise designed not to startle easily frightened dogs as well as possessing a large stride with a comfy underfoot, the design is both innovative and practical. Are you worried that your dog will get bored exercising without any outside smells to indulge in? GoPet has thought ahead and included a metal eyelet with its design, allowing for your dog’s toy of choice to be attached to the front of their treadmill; giving them the inspiration to run! Along with a low sale price for the quality you’ll receive, there’s nothing not to love. 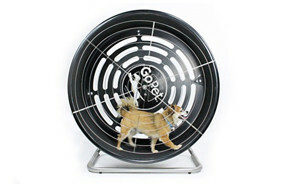 Last but not least, GoPet’s Treadwheel is back again but this time, designed for smaller dogs. According to fans everywhere, the most wonderful quality about this specific treadmill is that your dog must power it themselves. 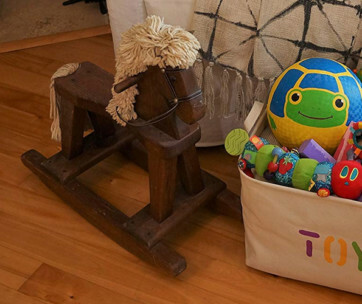 This not only encourages them to engage their brains but is ideal for dogs who won’t set foot near an electric treadmill. The pre-assembled wheel is remarkably designed. With a cushioned and matted surface, your dog’s paws won’t get injured or otherwise wear out the treadmill surface itself. Our favorite feature just has to be the brakes: providing resistance so dogs can continue to run at their own pace. It’s one of those products you don’t know you need until you’ve got it. Checking the tread length of your sought-after treadmill is crucial for your dog's safety. What you don't want is to order a treadmill perfectly designed for a Jack Russell rather than your St. Bernard! If your small dog inclined to injuries is used to slowly cruising round the block, chances are they won't be able to handle the speed settings of a Great Dane. When fireworks are going off in the night sky around them, does your dog run like crazy or remain nonchalant? If you consider your dog to be spooked easily, purchasing a treadmill with little humming noise will help them out greatly. Although dog treadmills often get a bad rap, there are times when going outside just isn't an option. Owning a dog treadmill is one simple way for your dog to fit in a large amount of their daily exercise. In extreme summers or winters, it's often unpleasant or in some cases, dangerous to take your dog outside for a walk. Especially in sunny states, dogs have a whole load of excess fur that us humans don't, which causes them to overheat a lot more. A dog treadmill operating in a temperature-controlled environment means that your pooch can enjoy their daily exercise without suffering the consequences. If your dog has been piling on the pounds, know that they're not alone. Over half of all pooches out there are overweight and this number just keeps on growing. When it isn't possible to get outside, then having a treadmill is ideal for losing weight and undoing stress on their joints. Placing your dog on the treadmill doesn't have to be all the bonding time you and your pooch get when using this machine. While always making sure that they are safe and sound, you could be developing your own physique alongside them – allowing for increased bonding time with your dog in a controlled environment. Your dog treadmill has finally arrived, you've put time aside for setting it up, and everything seems to be going smoothly so far. However, although we can prepare and prepare for a scenario, your dog's lively mind must firstly be put to the test. Treadmills (even for humans!) can be terribly intimidating. It's important to note that the frightening noises they transmit are able to scare off the toughest of dogs. Therefore, firstly reward your dog with tasty treats just for showing an interest in their new toy. Only once they're relaxed getting on and off the treadmill with treats in tow will it be time to move on to the next stage. 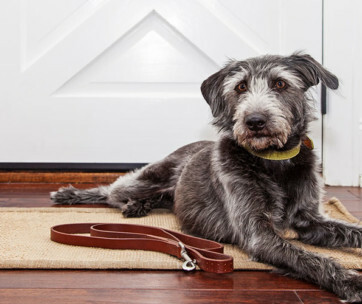 Before even completing this step, ensure that you're comfortably holding your dog's lead and are standing beside them so that they're fully at ease. Remember to keep rewarding your dog with treats throughout the whole process! If everything is going according to plan, up the ante until your dog is walking at a comfortable pace. Remember, every training step is an ongoing process – for the first few times, try not to surpass this point unless your dog is more than comfortable and already a natural at treadmill walking/running. Moving yourself further away from your dog's treadmill is a process in itself. Keep praising and encouraging them to move forward on the treadmill, even if from a distance. 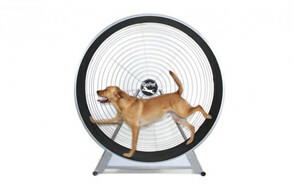 Once your pooch is confidently walking or running on the treadmill without any excessive panting, your job here is done. Now it's time to relax and let technology work wonders. You don't want a leash which could choke your dog; nor do you want one which is useless due to its length. Make sure to invest in one which is a happy medium between the two. This tip is pretty self-explanatory. Nobody wants an upset tummy! 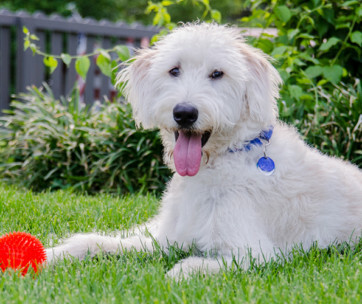 This tip is designed to maximize your dog's overall safety as well as making sure their new toy will last for years to come. Q: Can my dog use a human treadmill? A: This section is dedicated towards those of us who are lucky enough to have their own treadmill in the comfort of their home. Although many people don't understand why your dog isn't able to just hop on the same treadmill – although it may be a little over or undersized – as themselves, here are several differences to consider before choosing not to buy a treadmill specifically designed for your pooch. When running, humans tend to use a shorter track surface due to their shorter gait. Unfortunately for all the money-savers out there, larger dogs require a running belt which allows room for them to reduce the pace when need be. The length of treadmills for your dog have been specifically constructed to encourage optimal posture – therefore allowing yours to use your personal treadmill could result in bad stride and consequently, potential joint problems. Any decent treadmill usually possesses a ventilation system which encourage air flow, cooling down their user. For doggy treadmills, this system will be located elsewhere so any hair is prohibited from entering the system, leading to several malfunctions. Therefore, by allowing your dog to use your personal treadmill, you could be waving your warranty goodbye. The last thing we'd ever want is for our dog to get hurt in any way. Unfortunately, the end caps on human treadmills have the potential to rip dogs' paws and claws, sometimes resulting in long term injury. Q: Are dog treadmills safe? Canine treadmills are specifically designed so your dog will be able to hop on and off without any bother. As mentioned above, the high-quality dog treadmills possess a special belt so that your dog's paws or nails won't get caught. Likewise, we love the addition of siderails for the clumsier canines out there. Q: What size of dog treadmill should I buy? To ensure that your selected dog treadmill is suitable for your pooch, you must firstly measure their weight, exercise gait, and load performance. This concept is pretty self-explanatory, don't you think? This refers to your manner of exercise walking, which is often associated with improving your abilities in this respect. This concept refers to a dog's behavior towards peak exercise. These measurement guidelines give an accurate indication of the right treadmill for your pooch. Likewise, most treadmill brands offer their own personal measurements for a second opinion. Q: Should treading be the only source of exercise I give my dog? Absolutely not! If you cannot get your head around why your dog shouldn't need alternative exercise than being on their treadmill, imagine yourself solely working out on a treadmill for the rest of your life – even the thought is enough to drive you crazy! Dogs love nothing more than running around in the great outdoors chasing a ball and subsequently engaging their minds. Most of them are excited to bump into friends out on their walks to share the day with. The mental stimulation they receive from getting out and about is arguably just as important as the exercise. 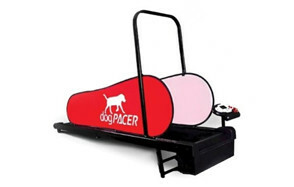 Our absolute favorite out of all the dog treadmills exhibited has to be dogPACER's Treadmill. Containing a powerful motor with a peak of 1.5 HP and a possible running speed from 0.5 up to 7.5 miles per hour, it certainly gives your dog's exercise variety. What's more, with its patented folding technology along with a silent motor and customized running programs is enough to make any pet owner giddy.